Best Masinagudi Resort, Guest House and Tree House! Secret Ivory is a one of best resort in Masinagudi to stay in for nature lovers with a tranquil atmosphere, homely food and a peaceful serene place in the lap of nature. One of the best features about Secret Ivory is no T.V. is provided in any of the rooms, which creates an atmosphere of serenity, calmness and one can enjoy the beautiful views in the most calm manner, in other words a truly calm serene and restful holiday. The wonders of Secret Ivory, the Tree House constructed on a “real tree” in the most eco-friendly way, is equipped with all the basic amenities e.g., Bed, Electricity, hot water and clean washroom. It offers a thrilling experience full of excitement. Imagine a night ‘Atop’ a Tree where one can listen to the sound of the surrounding forest in the silence of night! These rooms are two in Nos. with exclusive private verandah in the front facing the forest. It’s large spacious room lavishly built. Three bedded room large spacious with a verandah in the front, having beautiful mountain view. Secret Ivory, a Quality resort in Masinagudi, situated at the edge of lush green Mudumulai forest, with the Blue Nilgiri mountains overshadowing it, offers a breath-taking view and is a perfect getaway for nature lovers, for fun, for exotic foods and adventure away from the din and bustle of city life. Secret Ivory farm and Guest House is situated in Masinagudi village Achakari. The location enjoys the vista, flora, fauna and climate of the gorgeous foothills of the Nilgiris (Blue Mountain). The testimonial on the home page, stands witness to the services offered by and at Secret Ivory. 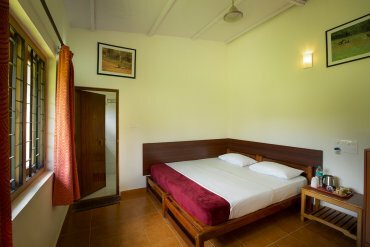 Our Farm and Guest House has well furnished spacious rooms, having neat and clean washrooms. The rooms have private balconies/verandahs offering blissful privacy. 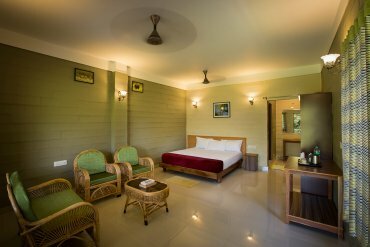 We are at the edge of Mudumulai forest and offer a wonderful view of the forest sitting in the balcony/verandah of the rooms. The staff is well trained and courteous to attend to individual needs. We are proud that Secret Ivory holds a special place in our guests’ heart, the reason for them to recommend us to their friends and families. Quiet and calm place away from hustle bustle of the city.. We had booked two rooms.. Tiger and Panther.. Cozy rooms with a beautiful view.. Kids had a wonderful time playing in the open area in front of the rooms..Ms Mani was very helpful and co-operative..highly recommend the jeep safari to Siriur. Soumya ZF, BengaluruComfortable and serene! Secret Ivory is a very nice place. Perfect for experiencing the serenity of the Masinagudi forest. It's located just beside the forest with wild animals (elephants, deers, dholes, etc.) roaming around most of the time. The rooms are very comfortable and clean with nice view from many of them. The service is good. Don't stay in the tree house for more than one night. It's not very comfortable. Try it out just for fun. The food is tasty and homely. even when she is on timeout. She is the star here. Its a beautiful property, surrounded by jungle. One can feel the peace of jungle, just need to be the part of it. Leave your gadgets away, and just feel the surrounding. Very nice place for family, specially for kids, as they get ample space to play\enjoy. Family and I stayed at the homestay for a day. Must say we, especially my daughter, enjoyed a lot. For a longtime, she wanted to stay in a forest-like place and her dream came almost true. We have picked the room close to the office, but the room near the electric fence -- I guess it's named Elepahant-- is awesome. If you are in a group, I suggest you to take that. The caretaker, Ms Mani, played the perfect host, briefing us about the place, eco-system and other stuff. My daughter too had some great moment with Mani madam. The quality of food can be better, though we enjoyed dinner. Dal fry, omelette and rotis were great. The road to the spot is muddy and patchy, but then you are in a forest! We stayed at Secret Ivory for a night and were mesmerized by the sound of the forest. Mani mam along with the boys give their best to welcome the guests with amenities best possible in middle of a jungle. Will surely visit again! Subash Mumbai, IndiaVery highly recommended and scenic property inside the forest! We stayed here as a family June 24th- 26th. One of the most fabulous resorts I’ve lived in. • Great host's in Ms. Mani and Mr. Ombalan. Very friendly, helpful and very informative about the places to visit. • Superb property and too scenic with the mountains in the front and deep dark forest at this side. • We stayed in the elephant and tiger rooms. Rooms are simple but cleanliness and comfort is top class. • Sightings of animals and lots of beautiful birds and peacocks around. • We also lived in the tree house which was right inside the forest. Very well maintained and it is a house on a real tree unlike the many other resorts which provide artificial tree houses. • This is probably the first best Masinagudi tree house hotel/ resort I’ve come across wherein it looks more better in reality than shown in the pictures online, including room photos. Really can’t think of any. Food is decent and could be better, but no complaints as such. Would definitely want to live here again. Keep up the good work Mani and Ombalan! The experience was not hyped, but real. It's quiet, it's at the forest edge and in the evenings, if you can just sit quietly in the verandah, you can relish nature in its purest form. We saw a tusker just outside our verandah, and he's a regular around 7.30pm as he comes to drink from their water trough. Incredible! Secret Ivory is one of the Best Tree house in Masinagudi. Mrs. Mani, the Manager, was the real reason we ended up there. You can't really trust all that you see on the Net.. but she would email regularly answering queries, and in person, the genuineness continues! The owner, Mr. Ombalan, grew up on that land, so there's an atmosphere of credibility. It's a great getaway spot, economical, and hope it stays a secret! An awesome experience.. staying in the Tree House which I would say is a nest perched on a tree. Tree house is outside the electric fence cutting it off from the rest of the property..making it a thrilling stay. In the evng while sipping a cup of coffee in the restaurant, watched a tusker walking along the fence. Was a gr8, memorable stay... Thanks to Ms.Mani & team for the gr8 service. I had a great experience staying at Secret Ivory resort .Memorable experience.Everything was perfectly planned.well mannered staffs and prompt service.Mrs.Mani madam service and hospitality was heart warming .Whenever asked for a help she did it with a smiling n tireless response.Not to forget to mention about the property owner Mr.Ombalan sir,such a down to earth person,whatever be ur grievances it will be rectified as and then immediately by him.Food was too good n homely.Rooms were spacious and very clean.U can enjoy the nature at its best from secret ivory,masinagudi.The cost will fit in ur pockets,the memories will sit in ur heart,unfadingly. It was a wonderful experience and we had what was expected in Mmasinagudi Resort. Starting from Mr. Ombalan, Ms. Mani and all the employees were very humble and down to earth. Mr. Ombalan is very experienced and had given lots of suggestions by his expertise. Resort was properly placed at the start of the Reserved forest and the room are perfectly planned to enjoy the view of the forest and the visiting animals. We had seen Elephant bull, Indian giant squirrel, Spotted deer, Rabbit, Peacock by just sitting at the balcony. During our visit to Bandipur safari, we have seen a Tiger. Dining hall was as clean as the room and the food was tasty and homely. Overall, unlike other resorts, Secret Ivory was one off the best place to stay and enjoy. We, a group of 4 friends selected this stay based on the largely positive reviews and secret ivory did not disappoint. We thoroughly enjoyed the service, food, animal spotting and bird chirping. The rooms are neat and well kept. The food is homely and Ms. Mani is exceptionally helpful. This is a wonderful place for a weekend getaway. and thus there is no other property or structure after this resort which enables guests to enjoy un-interupted veiws and sounds from a small part of the masinagudi forest range. The food is homely and made-to-order and the prices are moderate. I regretted staying just for a day here.Will definitely would like to go again. Arijitgh Bangalore, Karnataka, IndiaA serene destination to rejuvenate yourself!! This was my second visit to Secret Ivory. I am amazed to see how beautifully they have maintained the property over the years and upgraded themselves in many aspects. Location of this property is excellent, inside the forest and surrounded by Nilgiris. If you are lucky, you might be able to spot wild animals from outside your room in the night. Rooms: Rooms are spacious and toilets are very clean.Sit out area adjacent to the rooms are nicely decorated. Service: No words can justify their splendid service. Starting from welcoming the guests to guide them about neighborhood was one part of the warm service. When it comes to room service, I am truly amazed how efficient those boys are. Always with a smiling face they provided service, be it in the morning or late night. I wish I could have given more than 5 stars for their service. This place is highly recommended for families or bachelors. Everyone can enjoy the nature peacefully on their own way. Me, my wife and our daughter stayed in this resort. In my view it is very economical. Food is ok. Morning it is buffet with idly,upma,pongal and vada. Lunch is veg meals (white rice,sambar,rasam and poriyal). Chicken curry is provided if needed. We can order the night food according to the menu they provided. Evening they provided jeep safari. That was amazing. Jeep driver knows the place where animals can be spotted. Overall i enjoyed it very well. My suggestion , they need to provide camp fire + some fishing activities in the near by river. Local resort staff are very expert in it. Otherwise the activities will be limited to jeep safari. Thrilling experience. Should be visited at least once. Saw two Tucker in the night which was really fearful. Kids had a awesome time.Should stay at the resort in the night. Food was good. Service was also good. Stayed just for a day at the tree house , calm and pleasant location . great advice and talk with the staff ..very helpful people there . There could be a kettle with a few tea bags or coffee satchets kept in the room , Power back up system could be used during power cuts as it gets pitch dark in the tree house in case of power failure . Overall a decent place . Hariharan KEnchanting and superb gateaway at jungle's edge. Service at its best. Excellent location, fantastic service, extremely neat and comfortable rooms, very very tasty food and really helpful and friendly staff. A big thanks to Mr Om Balan and Ms Mani, who went out of their way to make our visit comfortable. And of course the various staff who help out in anything and everything. There are so many good things about Secret Ivory but I will stick to the best aspect. The best thing about Secret Ivory is its amazing location at the edge of the jungle and of course the impeccable service and food. Sitting in the armchair from one of the Elephant/ Tiger/ Panther rooms, If you are lucky, you can spot elephants and gaur and other species. . I would definitely recommend this place since they have rooms catering to different tastes .I hope to return on a full moon day and be lucky enough to spot some animals. One request to Mr Om Balan and Ms Mani is- it would be great if they could provide books on birds and wildlife in that area. There are so many bird species that it would be interesting to spot and identify the birds. when we arrived we hab a very warm welcome at the lodge. The bungalow was clean and very nice. We spent only three days but our daughters greatest wish to see elephants was fulfilled. It took two safari trips to see them. Both tours were organized perfectly. Especially during the second safari our driver was very patient. We waited for a long time until an elephant with its baby come out and crossed the street. So great! Food was also very delicious. The trip back to Ooty was also organized perfectly and we had a lot of fun with the driver. All in all great days! This homestay is right at the edge of the reserve forest. The room was spick and span and the room space is enough for a family of four ( 2 small kids, 5 & 8). The owner has his house right behind the rooms and tries to meet & greet the guests.. It is a small homestay with about 6-8 cottages/rooms and a tree house room. The front desk is manned by Ms Mani who was helpful right from the beginning of providing directions to the place and keeping us engaged during the stay. The breakfast and lunch provided was homely and tasted good. Do not expect a buffet spread but 1-2 items based on your order. The kids had fund seeing the peacocks, buffaloes, deer and cows. Elephants sometime come to the watering hole nearby but we did not see them during our visit. The last one kilometer of the road is a bit untarred but most of the cars will not have any issues navigating the road. Areas of focus could include having some outdoor games ( shuttle, football etc) & better pricing package to stay competitive. All in all, We had a good time. Secret Ivory is a beautiful guest house styled accommodation at Masinagudi. The USP of this place is the location; it's right at the end of roads and civilization and its only forests thereafter (separated by an electrical fence) for as long as the eye can see. We could see peacocks in our compound and deers right in front of our room (elephant room) wandering in the forest. Big shout to Ms. Mani for her patience, care and hospitality. She provided the most detailed assistance prior and during the stay with bookings, food, jeep trips et all. We went on the elephant camp, Lake side and forest jeep trips with Tambu who was well experienced and proved to be a life saver during a brief elephant chase we had in the forest. We also met the owner of the place (Mr. Ombalan) who was extremely genuine, hard working & grounded and knew the forest really well. We stayed at The Secret Ivory for 1 night. We had actually planned a Ooty trip from 24th, but then the whole family got another bonus holiday on 23rd. So we wanted to do something light, and I chose Secret Ivory for a Tree House Stay. The booking experience was very easy and quick with Ms.Manis help. TREE HOUSE: When we arrived at the Secret Ivory they had heavy rain and storm just couple of days earlier, so we were given the option to stay in a suite. My family readily accepted the offer. ANIMALS: I must say that this was one of the places thats very close to the nature with several birds and animals visiting the resort. We spotted Deers, Peacocks and Langurs in the campus. The sight of a weaver bird building its nest in the tree right outside our cottage was feast to our eyes. In the early morning, just sit at the portico and close your eyes; you could hear several birds chirping in the woods - peacocks, myna, weaver bird, little egret, ibis, gheese and ducks. FOOD: We predominantly had South Indian food at Secret Ivory, and I should say that the food was very homely and the kids liked the rice, rasam, potato curry for the dinner; and the dosa, cocount chutney and the sambar for the breakfast. I must mention that the Tea was very good and blended well with the atmosphere. Me and my wife especially enjoyed the tea at the portico of our room by watching the Deers and the Peacocks across the fence. The food was very aptly priced. No complaints. CLEANLINESS: The suite that was offered to our family of 4 was clean, bathrooms were tidy. I liked the sense of cleanliness when the hostess removed her slippers outside when she entered the room to help us have a look at the same. I had the opportunity to have a brief chat with Mr.Om Balan who is the owner of the place. Glad to know that a localite is trying to develop this place in a very eco friendly manner. Adarsh PSecretly lost in Jungle!! When our team decided for outing after heavy workload at office,we planned for Masingudi outing and called "Secret Ivory Resort".Got a good deal from them and finalized the place.We team of 21 were welcomed by Ms Mani care taker of Secret ivory with mouth watering lunch.Peacock and Deer also joined to greet us.They have arranged night safari in Jeep and we returned back around 8 and then joined Fire Camp followed by spicy dinner (perfect combination for Masingudi's chill weather).Next day early morning we headed to mountain visit through jungle and then returned resort for breakfast. Overall we all were extremely happy with the location of the resort and beyond expectation service.Worth visit place with group. We were a family of 5. We spent two nights at the resort. We stayed at the Tree House and a Double Bed Cottage. The place is at the edge of the jungle...very peaceful and serene. You could hear the birds chirping, saw a malabar squirrel eating fruits from the tree, the peacocks joined us while having breakfast..they were wild peacocks that came in from the jungle. The place was very calm and peaceful. The stay at the Tree House was a beautiful experience. It had toilet facilities too. The cottage room was clean. Solar hot water was available round the clock. The food was good. The people were very helpful. Enjoyed some fishing by a stream and the children were delighted to catch some small fish. Its a simple place with all amenities. No luxuries. Overall we enjoyed our stay at the resort and would gladly recommend it to those who enjoy being with nature and like some peace and quiet. My second visit to Masinagudi and my first stay at Secret Ivory. Well i can safe that this is nothing short of a splendid view close to nature and nature everywhere. Rooms sport a good modern look with plenty of place to rest around. Right from the booking till the see off, whole hearted thanks to Ms. Mani who displayed exemplary commitment, follow up and communication with guests. Mine and my friend s family were overwhelmed with the hospitality . A must visit place to have a complete relaxed holiday for 2 days. I am with my wife had a trip to masanagudi last week. We called and booked Secret Ivory as my friend suggested. It was worth a visit. Very good place to relax. We could see the deers and peacocks behind the room from balcony. Food is also good. Mani mam helped us and so kind. We regret only thing that we couldn't extend our stay for a day. Definitely i will visit and will recommend for my friends too. 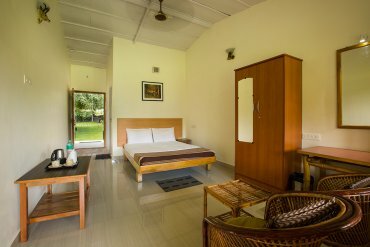 This resort is located in the lap of the dense forests of Masinagudi which has a thick population of the Royal Bengal Tiger, the great Indian elephant, the leopard, wild boar, bison and many interesting wild species and the very location enhances the chances of spotting one of these from your balcony manifold. With extremely courteous staff lead by Ms Mani demonstrating courteousness right from the day we booked the rooms till the time we departed they never made us feel like visitors, it was as if we were a part of the same family. In Summary, the Rooms were neat, strategically located. We stayed at Secret Ivory for three nights. Mr Ombalon, Ms Mani, Vinod, and the safari drivers gave us the best advice to see wildlife - but with a focus on safety. The staff are helpful and interested in guests, the food is made to order, and the accommodations are new and on the edge of the jungle. This is a quiet resort where you will focus on the sounds in the Mudumalai jungle. You will not get any closer to wildlife in India. Ms Mani was particularly helpful in giving us all options to reach the resort. This is one of the best places to drop in. It is right next to the Mudumalai forest. Elephant and deer can be very frequently heard and spotted. The stay is very calm and quiet. The best place to spend a quiet time with loved ones. 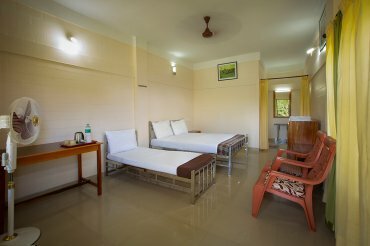 Lovely place coupled with a very good room facing the forest along with lovely evening weather. What else you want! That's secret ivory! Ur welcomed with electric fences signalling the wilderness. A beautiful tree house out of the fences. I missed it this time. Next time will do it! Stayed in elephant, the only room facing the forest. Ur just too close to the small water pond that if an elephant comes in, u just see him / her head on!! A good stay, very memorable since had a very good sightseeing trip in Mudumalai as well. Rating it top for the experience!! Jomson G, KeralaVery good place to relax. I am with my wife had a trip to masinagudi last week. We called and booked Secret Ivory as my friend suggested. It was worth a visit. A very good place to relax. We could see the deer and peacocks behind the room from the balcony. Food is also good. Mani mam helped us and so kind. We regret the only thing that we couldn't extend our stay for a day. Definitely, I will visit and will recommend to my friends too. My second visit to Masinagudi and my first stay at Secret Ivory. Well, I can save that this is nothing short of a splendid view close to nature and nature everywhere. Rooms sport a good modern look with plenty of places to rest around. Right from the booking till the see off, wholehearted thanks to Ms Mani who displayed exemplary commitment, follow up and communication with guests. Mine and my friend s family were overwhelmed with the hospitality. A must visit a place to have a complete relaxed holiday for 2 days. We were a family of 5. We spent two nights at the resort. We stayed at the Tree House and a Double Bed Cottage. The place is at the edge of the jungle...very peaceful and serene. You could hear the birds chirping, saw a Malabar squirrel eating fruits from the tree, the peacocks joined us while having breakfast..they were wild peacocks that came in from the jungle. The place was very calm and peaceful. The stay at the Tree House was a beautiful experience. It had toilet facilities too. The cottage room was clean. Solar hot water was available round the clock. The food was good. The people were very helpful. Enjoyed some fishing by a stream and the children were delighted to catch some small fish. Its a simple place with all amenities.Overall we enjoyed our stay at the resort and would gladly recommend it to those who enjoy being with nature and like some peace and quiet. When our team decided for an outing after heavy workload at the office, we planned for a Masingudi outing and called "Secret Ivory Resort".Got a good deal from them and finalized the place.We team of 21 were welcomed by Ms Mani caretaker of Secret ivory with mouth-watering lunch.Peacock and Deer also joined to greet us.They have arranged night safari in Jeep and we returned back to 8 and then joined Fire Camp followed by spicy dinner (the perfect combination of Masingudi's chill weather).Next day early morning we headed to mountain visit through the jungle and then returned resort for breakfast. We stayed at The Secret Ivory for 1 night. We had actually planned an Ooty trip from 24th, but then the whole family got another bonus holiday on 23rd. So we wanted to do something light, and I chose Secret Ivory for a Tree House Stay. The booking experience was very easy and quick with Ms.Manis help. TREEHOUSE: When we arrived at the Secret Ivory they had heavy rain and storm just a couple of days earlier, so we were given the option to stay in a suite. My family readily accepted the offer. ANIMALS: I must say that this was one of the places that's very close to nature with several birds and animals visiting the resort. We spotted Deers, Peacocks and Langurs in the campus. The sight of a weaver bird building its nest in the tree right outside our cottage was the feast to our eyes. In the early morning, just sit at the portico and close your eyes; you could hear several birds chirping in the woods - peacocks, myna, weaver bird, little egret, ibis, geese and ducks. FOOD: We predominantly had South Indian food at Secret Ivory, and I should say that the food was very homely and the kids liked the rice, rasam, potato curry for the dinner; and the dosa, coconut chutney and the sambar for the breakfast. I must mention that the Tea was very good and blended well with the atmosphere. I and my wife especially enjoyed the tea at the portico of our room by watching the Deers and the Peacocks across the fence. The food was very aptly priced. No complaints. I had the opportunity to have a brief chat with Mr.Om Balan who is the owner of the place. Glad to know that a locality is trying to develop this place in a very eco-friendly manner. Secret Ivory is a beautiful guest house styled accommodation at Masinagudi. The USP of this place is the location; it's right at the end of roads and civilization and its only forests thereafter (separated by an electrical fence) for as long as the eye can see. We could see peacocks in our compound and deer right in front of our room (elephant room) wandering in the forest. Big shout to Ms Mani for her patience, care and hospitality. She provided the most detailed assistance prior and during the stay with bookings, food, jeep trips et all. We went to the elephant camp, Lakeside and forest jeep trips with Tambu who was well experienced and proved to be a lifesaver during a brief elephant chase we had in the forest. We also met the owner of the place (Mr Ombalan) who was extremely genuine, hardworking & grounded and knew the forest really well. Good food, good Service, good rooms and a very friendly staff. Rooms are quite decently priced and requests for early check-ins/late check-outs are accommodated whenever possible. Only thing that you need to keep in mind is that the food needs to be ordered much in advance (our lunch order was taken upon check-in at 1130 hrs). The food was very homely and tasty. We stayed in the deluxe room, which were very spacious and neat.They also have one tree house. The tree house is a great option for a couple/3 people. It is at a good height and very close to a watering hole trail. At night you get powerful spotting lights to help spot wildlife. Entertainment options are very limited (as I think they should be in a wildlife lodge of this sort). There are no TV's in the rooms. There are a carrom board and TV in the dining area. Beer is the only alcohol available and slightly overprices. I would suggest buying liquor at Masinagudi town. Do not try to cross the Karnataka border with liquor. Checking is quite strict and the cops will confiscate any alcohol that you may be carrying. Staff members Alex were very helpful and I believe he deserves a special mention here. All in all, a great place to stay. I went with friends, so cannot comment on how the place will be for a family getaway, but really don't think it'll be any different as far as the experience is concerned. We staid in secret ivory for 3 days and it was great! The location is amazing! In the middle of the forest! We've staid in the elephant room and on our first night we saw a black panther behind the fence (an electric fence). At the second night we've heard two tigers mating!!! The rooms are very clean and the service is wonderful! To sum up, we strongly recommend this guest house! It's awesome!!! We stayed at the secret ivory for 2 nights in December,2011. We did not expect much but were pleasantly surprised. The guest house is located in a serene area with the excellent views of the hills and dense forest. We thought that this guest house had the best location compared to the many others available because of its excellent and unblocked views. It was a relief to see the cleanliness of the rooms and the bathroom was spotlessly clean. The staff here were very warm and friendly and so was the owner Mr.Om Balan. The food served was good, almost like home cooked food. This place has only 8 rooms which is a big advantage for visitors as it helps stay away from the hustle bustle of large hotels and the place is quieter too. The best part was that there is no TV in the room, which makes one enjoy the silence, calm and beautiful views. Truly and restful holiday. We spent 1 night in the tree house.The experience was even better It was the highlight of the trip apart from the many animals we saw on our safaris. This cute little tree house sits way atop a tree, amid a bamboo thicket. The view from the tree house is awesome too. The surroundings were beautiful. On the whole, it was nice to get away from busy city life and enjoy this peaceful, serene, calm and heavenly Mudumalai sanctuary. Our stay at Secret Ivory made our trip more memorable. We will definitely stay at Secret Ivory again. Generally, I don't write any reviews. This is the first time; I am writing & sharing my experience due to the reason that people should definitely not miss such a wonderful place. After hours & hours of gathering information from several blogs and reviews, we finally zeroed on to Secret Ivory as our stay at Masinagudi where we had stayed for 1N/2D on 19th & 20th-Jan-2014. We are a team of 6-pax and had reserved for 2-Standard rooms & 1-Tree house. We were warmly welcomed with a big smile by the Owner Mr.Ombalan & his staff Mr. Alex who were very courteous. Mr. Alex was a perfect host & entertained us thoroughly with his one line witty lines. He knows the pulse of his guests and made us feel comfortable. We enjoyed the stay very much. The resort is built at the edge of the forest 2 kms off the main road; I mean it’s truly paradise amidst the jungle. The tree house accommodation is located few foots outside the resort in the jungle which was separated by an electrical fence. The standard rooms were very neat and cleanliness with all the basic amenities. The standard room is the forest facing room. The view of the blue hills from our room is breath taking & one can gaze simply at the mountain for hours peacefully, nature is pristine and untouched at its best. Never ever, never ever miss the unforgettable Jeep Safari done by the owner Mr.Ombalan itself, a veteran guide/trekker who drove us through the tough forest roads. Overall it was a pleasant experience , would be more suitable if u want "nothing to do" kind of place,, just relax and chat. Secret Ivory is located at dead end road, towards the forest, it provides some seclusion, though there are resorts and houses on the other side. Food quality needs lot of improvement. There is a mention of buffet , but you will be asked to opt for ala-carte. Prices don't match the quality or the taste. Otherwise nice friendly staff, good service, clean bathroom. Camp fire was arranged during which we spotted a Lone tusker just near the fence of the resort, below the tree house -- which was the high point of stay. I suggest the owners to add some hammocks, one or two swings, merry go round etc....so that kids will have something extra to do. Table tennis, volleyball court and archery can be made available, just to get the guests occupied during the afternoons and early evenings. Weather was surprisingly good even in peak summer. We as a family of six including my dad and mom reached this jungle resort on 7th June afternoon at 12:30 PM. The owner Ombalan welcomed us. We booked a tree house and two rooms facing the mesmerizing mountains. Post lunch we went to Singara River and had fun. Then we went for a night safari in an Open Gypsy in a dense forest which costed Rs.3500 and it was worth more than that. We had the life time shock in the night safari when 10 feet Single tusker from the left almost broke a bamboo tree and dashed our car with anger and we were saved by a nere 5-10 metres distance. It was a life time experience. Everyone were frightened. In the morning only myself and my brother went for the trek since everyone else couldn't come out of the night safari shock. This is my 4th visit to Mudumalai and I would say Sanjay is the best trek guide over there. We saw 2 elephants, bears, bisons and many more in the trek. I will definitely go back to this resort again. Adventure seekers don't miss this place. Thanks to the Owner Ombalan and his associates for providing us an excellent trip. Rujila Bengaluru, IndiaSimple and great place to stay! After so much of research and rejection, we finally zoomed down this resort in Masinagudi for our small vacation. I must say, I will never regret this choice. We had a warm welcome by the staff who were very polite and co-operative until the end. They made sure all our requests are addressed. The location is simply breath taking. Could not have asked more.The food is good. Don't go for Buffet as it can cost much than choosing food from the menu. We stayed in the tree house and in a standard room. The tree house is simply awesome and safe too. Bathrooms and rooms were very clean. They have both hot water and shower facility. No Tvs which is a bliss. Opt for a standard room as it is little far from the dining area and the noise (or) opt for a tree house which has excellent view and thrill. The resort team takes care of the safari (rs. 4000 per trip) and trekking (rs.500 per head). Opt for night safari rather than a day as it gives you the most thrilling experience of your life (though we didn't sight much of animals except for deer and an elephant). Go for trekking early morning as advised by the staff. The trek was short though. The place is not crowded at all and very tranquil. I will definitely recommend this place. We were unlucky with our timing (during the migration season) so didn't see as much wildlife as we'd hoped for, but we still loved our time here (4 nights). The rooms were large and very comfortable, food was plentiful and very good. Re. wildlife, we would recommend the dawn safari on foot. Though we saw no big cats, it was still a great experience to be truly out in the Indian forest at first light, plus we did see some wild elephants, bisons, monkeys, deers, peacocks, wild pigs and eagles. Would 100% not recommend the bus safari at Mudumalai National Park. A theme park like experience involving queuing for an eternity, then paying to sit on the world's noisiest bus (which obviously scares away any animals) and driving briefly up the main park road, before looping through a small section of the forest as tourists throw litter out of the windows. Wildlife spotted: a peacock and a wild pig. Both of which looked suspiciously like they were thrown in at the end of the route..
We travelled to Masinagudi on 19th of October 2013 and stayed for 3 days and 2 nights. Pratik D Calcutta, West Bengal, IndiaBe there only if nature beckons you!!! Wonderful!! The simple word to start with. Just the kind of resort I was looking forward to-tranquil, spacious, simple, cosy, caring staff, great food, spectacular view, and above all, closest to the forest one can get to. Another nice thing about the resort is that there are only 9 rooms here within the resort area of 2.36 acres. I have checked locations of other similar resorts in the area in Google maps but this certanly is the best. Jeep safaris to the forests were wonderful. We did not go for trekking but got to know from others staying there that it was an unforgettable experience. Even the experience of fishing in the stream was unforgettable (although 6 fishing rods, more than 12 prying eyes, and some investments in baits proved futile in the end). We were four families in our group and travelled to Ooty from here. Even Our city-bred kids were very upset for leaving this resort and staying at Ooty. Only a request to other visitors-please avoid if you are in a mood of partying and boozing. Evenings are quiet here. You have plenty of options to spend your time leisurely:-light up a fire, BBQ, sit quietly with a bottle of beer, play indoor games, or chat with the friendly staff and owner Om Balan. The Mudamalai Tiger Reserve was a side trip for us, recommended by my son whose PhD thesis is based in Mudamalai field research. Son also advised us to stay at Secret Ivory, so we booked in and they sent a Jeep to collect us in Ooty. The road from to Mudamalai from the Nilgiri Hills is a roller coaster ride -- 36 hairpin bends with nerve racking notices about accident statistics along the way. In order to spend 2 nights at Secret Ivory we did it in both directions --36 down and 36 up. It was worth the excditement. Secret Ivory is modern, basic but totally acceptable by any standards. One does not expect luxury in a nature reserve and I have stayed in far less comfort in the Negev desert for example -- or in the Atlas mountains. The rooms are arranged into two blocks -- with an additional one in a tree house outside the electric fence. The fence is supposed to keep elephants out of the compound -- but there was a large pile of elephant dung on the grass in front of our balcony. We were told a group had crashed the fence a couple of days earlier. The eating area is in a separate building, but the friendly staff will deliver to your balcony if you wish. We sat out with a bottle of Kingfisher beer, watching langur money frolic in the trees close by. A variety of exotic birdlife provided additional entertainment. The dirt roads across the reserve are now closed to motor vehicles, so the only way to explore is on foot. We set off on an early morning walk through the jungle with 2 guides -- one up front and one behind. They were obviously professional and sensitive to our needs...so we trusted them and were rewarded with a close view of a group of wild elephants and fabulous bird watching -- notably a large red, white and black woodpecker hammering away at a tree a few feet away from our binoculars. We also saw a wild rooster (enormous), wild peacocks, wild boar, spotted deer and monkeys galore. We narrowly missed seeing a tiger. One wonders why a place set up for people who love wildlife allows this to happen. Abhik- ChennaiAn Enchanting Experience !!!!! We went to Mudumalai in Jan'2013. The whole trip was a great experience. 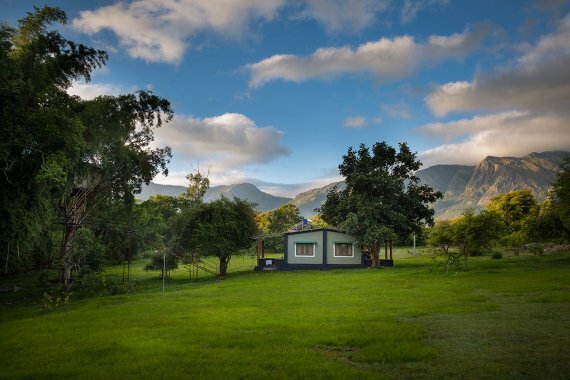 This place is located in the serene pristine backdrop of Nilgiri moutain, in the middle of mudumalai wilderness. The Rooms were clean and hygienic , the hotel stuffs were very warm and friendly. They arranged for night camp fire which got better with chicken barbeque and grilled chocolate banana . In the night safari we saw Spotted Deers, Porcupine, Mangoose, Elephants and a glimpse of a leopard. Next morning we went for trekking in the Jungle where we encountered with single Tusker, saw Giant Malabar Squirrel, sambar deer , Egale, peacocks,Hawks and number of different species. At noon we went to the nearby Moyer riverside where we tried fishing and some of also bathed there. In the afternoon while driving through the forest near Theppakadu, we got our best moment , seeing a full grown Leopard in the wild from 30 feet distance. The Trip just got perfect with the awesome quality of delectable food, cant expect better than this. Truly a memorable trip !! This was a quiet place to stay in Masinagudi. It is good to spend some time in the country side. The staff is very friendly and the food is good. My wife especially recommends the early morning trekking, which was organized by Secret Ivory staff : she saw tigers. I did not see them because I did not believe this could be possible. We are two familys, we go to 25th December ,that staff was very friendly, staffs take care everything, there arrange for safari we saw the lapod, next day we go to the trekking we saw the two tigers,beer and elephent guides also good, the food its very tasty, very clean the rooms and place, we enjoy the holidays, thank you for staffs. We were there in August for two nights. We stayed in the tree house. In the room there is also a bathroom with shower. There is no glass in the windows but only curtains and over the bed hangs a mosquito net for insects. At night it is wonderful to be lulled by the wind listening to the sounds of the forest nearby. One night we saw wild bisons in the house! Cool! It 's all very clean and quiet and the staff is really friendly and helpful. In particular, the owner is a really nice person so it is very nice to talk to. Food is average, but cheap. Trekking in the park early in the morning was a great experience. Unfortunately, In Masinagudi, the natural reserve was closed by the central Government pending the enactment of a new legislation regarding access of tourists. However, we did go for a drive in the streets surrounding the park and so we saw a lot of animals: elephants, wild peacocks, bison, buffalo, warthogs, monkeys. We arrive at the Secret Ivory by a bumpy road, but it is nice to be in a place isolated from the chaos of India. Perfect place in Masinagudi for those who want to be in nature and relax completely. We found out about this place by word of mouth in Mysore, so were cautious at first but it turned out great. They even have a tree-top cabin, which is a bit more pricey but looked like a lot of fun. The hosts were nice, the grounds were clean and safe. The organised elephant tours weren't as good as ones we had further up north, but we definitely saw a lot of elephants. Secret ivory is my favourite place in Masinagudi. We, a family including our 8-year-old daughter stayed here for 1 night on 15 August 2012. This Masinagudi hotel is basic, with hard furnishings, but very clean (vital as there are many ants in the forest). It is located at the end of a rough track, near the forest, surrounded by an electric fence to keep out unwanted big critters. The windows have mosquito nets, which appeared effective. We found the price of the stay very low. It's all pretty basic, but that suited us - the place is near Tiger Paw, which looks much more flash if that's what you're after. Food is available on site and is good and very cheap. During our stay in this masinagudi resort, we observed that the other guests seemed to be a younger group but there was no disruption as a result of that. The staff were most obliging and - unusually in our experience for this grade of place in India - responsive to emails in English, able to price requests quickly and arrange lengthy car transits reliably etc. In our experience definitely worthy of trust. They were also very able to accommocate our request for a short guided walk in the jungle, suitable for an 8 year old, and a jeep ride round the roads in Mudumalai Park. We were lucky to see wild elephants on 2 occasions, one of which was a huge "tusker". Overall, highly recommended indeed provided you go expecting the experience to be quite rough and close to nature. SecretIvory is a very nice place with very reasonable pricing Resort in Masinagudi. The forest trek organized by the hosts is a super experience. The property is simple, neat, and clean. I love it that they do not have TV in the rooms; the rooms, though basic, are clean and neat with adequate space for sitting out and reading a book or just watching the birds get busy in their business. Food is simple and yum. The best thing about this place is the people (really do not want to use the word staff) are very friendly and cooperative. It was the third outing (with family as well as friends) to this very place and sure shall go there again. Surely would recommend this place. Stayed at Secret Ivory with family on Mar 23, 2012. This is a great place, though there are no frills attached. Experience was amazing, Staff were very courteous. It's a must-stay place if you are going to Mudumalai/Masinagudi. They have a tree house too! Vinmen Saint Louis, MissouriA very pleasant stay at the Secret Ivory Guest House. We stayed at the secret ivory for 2 nights in December,2011. We did not expect much, but were pleasantly surprised. The guest house is located in a serene area with the excellant views of the the hills and dense forest. We thought that this guest house had the best location compared to the many others available because of its excellant and unblocked views. 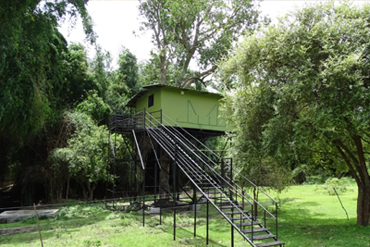 We spent 1 night in the tree house.The experience was even better It was the highlight of the trip apart from the many animals we saw on our safaris. This cute little tree house sits way atop a tree, amid a bamboo thicket. The view from the tree house is awesome too. The surroundings were beautiful. On the whole, it was nice to get away from busy city life and enjoy this peaceful, serene, calm and heavenly mudhumalai sanctuary. Our stay at Secret Ivory made our trip more memorable. We will definitely stay at Secret Ivory again. Lakshmi Rajneesh – BangaloreGotta see it to believe it! We went with our family (10 members total) to Secret Ivory from Bangalore on June 10th 2011 for a 2 day/1 night stay. Mudumalai National Park/Masinagudi is about a 30 min drive from Bandipur, and Secret Ivory can be found deep inside the forest area, down a beautiful long winding road that gets closer the foot of the mountains. Lots of elephants and peacocks to see on the way too. When we got to Secret Ivory, the view was absolutely breathtaking. Like the title says, "Gotta see it to believe it". There are no words to describe the calm, peaceful and beautiful surroundings! There were lots of Langurs hanging about with their familes too. We were greeted by the owner, Om Balan, who is a also a veteren guide and tracker, and the rest of his staff. Secret Ivory is a quaint little homestay sort of a place with a very homely feel, to both the rooms and food cooked. The rooms are very neat and well maintained. Om Balan's a very down-to-earth guy, always ready to help and answer any questions you may have. They also arranged an amazing night safari for around 2-3 hrs time! The night safari was probably the highlight of our stay there. Just to be so close to the mountains in the jeep parked to the side of the road under the starry sky with some clouds passing overhead (feeling like its within your reach).....man, that's Heaven! We also got a camp fire lit up once we back at the resort later that night.The food at Secret Ivory, to be honest, is not the "hotel/resort" material. But it's definitely yummy, healthy, home-cooked food (They serve both veg and non-veg)! Secret Ivory is definitely a place one can go on a family vacation or on a romantic getaway. Worth the money, worth the journey, worth the scenery and definitely worth the experience! Will surely pay them a visit again sometime!! A great place for nature lovers with excellent views. Secret Ivory Masinagudi reort have a tree house and it is a must try. Can get hot inside tree house during day time. It is an exciting experience to have. They have placed the tree house after their electric fence cutting it off from rest of their property. So to get into their property one needs to call them and ensure the electricity to the fence is cut off. In Masinagudi, secret ivory campus you can view Occasional elephant, often sighted spotted deer, peacocks, langurs, Indian macaques make the place very exciting. Food they serve is very homely and light on stomach. We visited the place on 26th an 27th of this month. Excellent place..reasonable rates...above all the service from Mr Ombalan and team..like family....thank you all. Vinod thank you for your service.. Secret Ivory is the best resort in Masinagudi ...! This property is placed abutting the Mudumalai jungle near Masinagudi. When you are approaching this property while getting down through Kallatty Ghat road, you have to take a left turn well before Masinagudi. An electric fence separates this property from the jungle. I visit this place frequently with my family and friends for a decade. In fact I have conducted Fashion Photography Workshops on two occasions for my students. The place is beautiful and it is the place for people who seek quietness during weekends. This property is owned by Mr.Ombalan who is very friendly and care taking. He can arrange a Jeep if the tourists want to see nearby places. Though the food is not extraordinary, it is very homely with reasonable rates. Rooms have adequate space and kept neat and clean.The place has ample space for car parking. In Masinagudi, I have seen elephants, bears, Sambars, Spotted deers etc. close to this place many a time. In fact I heard roaring of a tiger very close to our secret ivory guest room during my last time stay at the early morning. Secret ivory is a affortable and Quality Resort in Masinagudi. Secret Ivory is a nice resort to stay in Masinagudi with good homely food.The service was good in general, views were breathtaking. Ombalan & Alex are great and will take care of all requirement. They made arrangements for jeep ride into the jungle and was an amazing experience.Worth every penny spent and if lucky you can even spot some animals sitting near your room. Very highly recommend this place for nature and wildlife lovers. Rnbhatta Bengaluru, IndiaGreat place to stay . Very close to wilderness. Great Staff. Awesome experience. Staff is very caring. Great location. Clean beds and bathrooms.Great food. All these with a great price. Food customization and quality are amazing. I wish we had stayed longer. Highly recommended. Secret ivory is a Cheap and best accommodation in masinagudi. The resort is in a very peaceful place, no disturbance nothing. The owner stays there, so he ensure everything should be perfect, very genuine person, talked to with him. The rooms, washrooms are neat and clean , well maintained, every fittings are white in washroom and rooms. The food was awesome. Great place to stay and enjoy. You can watch deers, rabbits come near resorts at night time. This entry was posted on June 23, 2017 by Ivorylogin. Copyright © 2019 Secret Ivory. All Rights Reserved.